A reader sent me the following SOS this week and I thought I’d share my answer with those of you who may also have some of these pieces in your own home. Dear W: Teak is becoming extremely popular as younger collectors rediscover the furniture of their parent’s or in some cases, grandparent’s generation. Finn Juhl is a well known name in the world of mid-century modern furniture and yes, if you want to have it to last you need to know how to take care of it. Some background: In the mid seventies I built a dining room suite with table and four chairs out of mahogany. I decided I liked the natural light color of the wood so I did research on how I should protect the surfaces, (especially against water marks). I found out that teak oil was the only product that became absorbed into the pores of the wood. With each successive coat that was applied the finish would continue to fill the pores and as a result the wood got harder and harder which meant it was better protected. This was important especially during that time when people still smoked. Many dining and coffee tables got ruined because someone left a cigarette burn on the edge of the table – hard to imagine today! However, if the furniture had been protected with plain, un-tinted teak oil, a person could sand down the burn and still save the table top because the finish had permeated the first several layers of the wood. On a table that was not protected in this way, the burn would damage the finish as well as the raw wood below it. This would then require the refinishing of the entire table top. I am telling you this so that you can understand why only plain Teak oil without any other additives will work for this process. As soon as a layer of urethane, varnish or even wax is applied on a surface that has been previously only protected with Teak oil, the wood can no longer absorb the oil. So you need to clean it. You said you used Murphy’s oil Soap to clean your wood and it left streaks. I have heard of this happening to others before and to be honest I have never been a fan of the product based on my particular experience as an antique dealer. You need to remove the residue left behind from the oil soap before you do anything else. Because I am not there to see the problem I hesitate to tell you what to do, however I can suggest a few things that I would try. Remember to always test any product in an inconspicuous spot and take all safety precautions. I would try cleaning the streaks with a clean cloth dipped into 1 part sudsy ammonia to 8 parts tepid water. Wipe with the grain. Do not allow the wood to be too wet. Use a dry cloth in between swipes. Rinse with vinegar and water to get rid of the residue and let the wood dry. You can help it dry by polishing it with a dry cloth in the direction of the grain. Repeat if you need to. Never use a terry cloth rag. The loops could catch on loose wood splinters and damage your furniture. Some people use TSP (trisodium phosphate) but I have always found that to be too harsh on wood furniture. Once it is dry, look at the top of the piece. The streaks should be gone if what caused the streaks was melted wax polish, or built-up grime. If the streaks are not gone then you have a bigger problem -it means that there is a finish of some type on the piece and you may have to strip the credenza in the conventional way. At that point you have nothing to lose so I would try a stronger solution of ammonia to water and see if the streaks disappear. (try 1 to 4 parts as above). Cleaning antique furniture can make it glow again. Once the streaks are gone, use a pad (like the kind you use for French polishing) to apply a new coat of plain Teak oil, rubbing the pad in the direction of the grain. 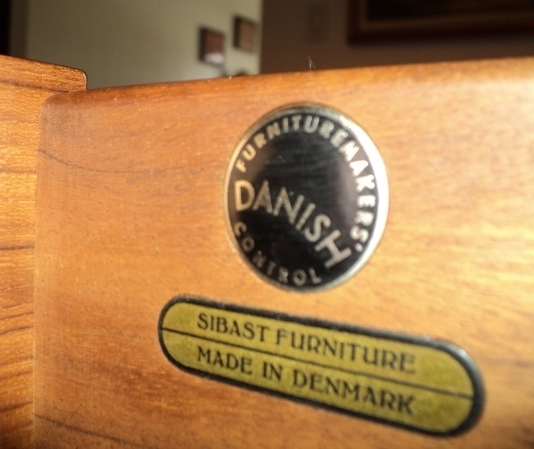 There are good name brands of teak oil out there and you may find that sometimes teak oil is sold as Danish oil so check with a knowledgeable retailer. Once you have your credenza looking great, never use anything else on any your teak furniture but teak oil. One last tip: don’t use this teak oil on any furniture that has a non-oiled finish. But that’s a topic for another blog! Let me know how it turned out. Good luck! 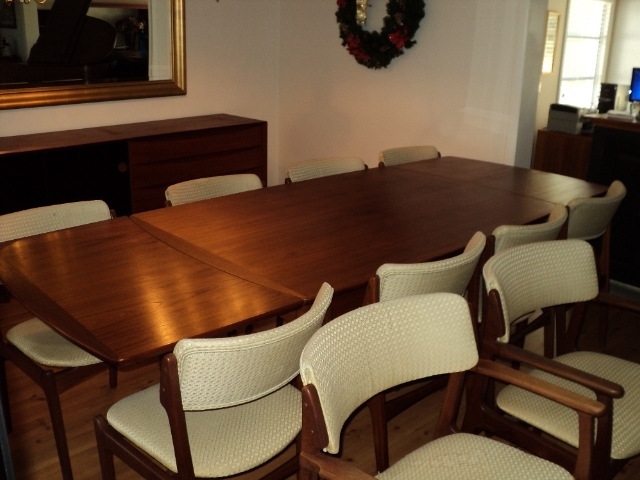 I have a Danish Teak dining room set. I bought it in 1971 while I was in Germany from a Danish sales person. It has not been keep up and I think it will need a good cleaning before applying teak oil. What do you recommend as a cleaner? What would the label of a “plain teak oil” say? How can I tell what else it may contain or at what concentration? 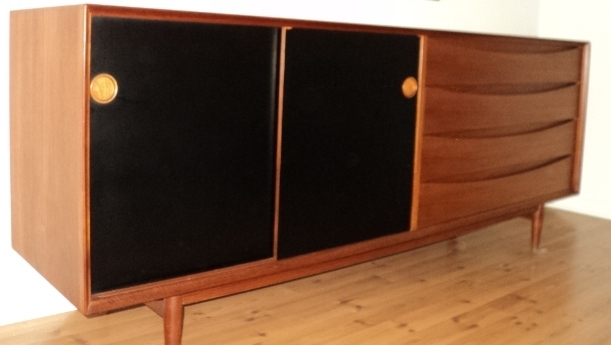 Johanne, These are pictures of my Arne Vodder and Erik Buck teak pieces. I wanted to share that they have only been cleaned or treated with teak oil and the beautiful look of all the pieces is a result of that! The table is under a chandelier and the light enhanced the natural shine of the finish. Teak is an incredible wood and when taken care of properly, will maintain its original, intended finish. These pieces were purchased from the original owners’ daughter. Her mother bought them in Germany where her father, an officer in the U.S. Army, was stationed during the war. Vendors brought their wares to the base and her mother bought them at one of these events in 1960-62. They entertained a great deal, thus the extension table and 10 chairs! When the war ended, the furniture was shipped to the states to Annapolis, MD and eventually made its way to Florida. I like knowing the history of the pieces and the fact that it’s remained together. Yes knowing the history of an object makes a person appreciate it even more. In your case, thanks to the info you have, it is easy to understand how we are simply stewards of these objects from the past and if we take care of them they will be around for another generation to enjoy. Good job!